I was very interested in the fact that JDM liked Malcolm Lowry's UNDER THE VOLCANO alot. I discovered this novel in 1961 when I read a rave review in a late 1940's issue of THE SATURDAY REVIEW OF LITERATURE. I've since read and reread it a half dozen times and it is one of my all time favorite novels. But I have trouble understanding why anyone would move to Mexico after reading it. Instead my reaction would be to stay away! One of the best horror novels I've ever read. 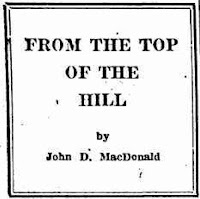 MacDonald himself cited money problems -- attempting to make a living and save money earning only two cents-a-word -- as the main reason for moving to Mexico, but also the recent death of his wife's mother and -- yes -- the couple's love of UNDER THE VOLCANO, which was published the year before. And they headed for Cuernavaca, the setting for Lowry's novel (although he called it Quauhnahuac). They weren't the only ones. There was a relatively large American "colony" there which included many writers, artists and other "bohemians." 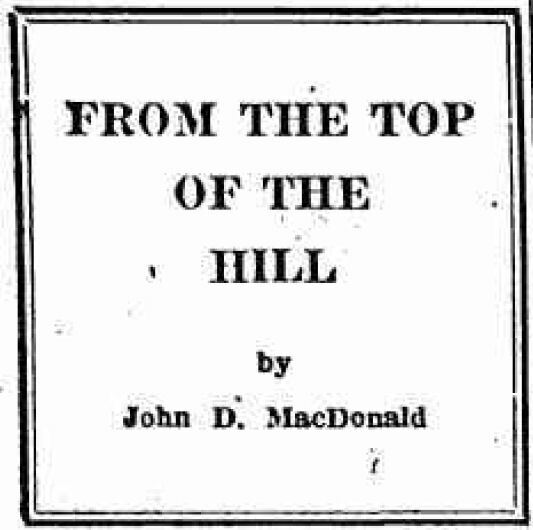 The country agreed with MacDonald. He produced over 70 short stories while living in Mexico, made his first big sale there ("Looie Follows Me" to COLLIER'S for $1,000) and later used the locale as the setting for his (still) biggest-selling novel, THE DAMNED. He and Dorothy even went back there nine years later to live during the winter of 1957. So, despite the "horror" in UNDER THE VOLCANO, there must have been something alluring in the novel to attract the MacDonalds there. Incidentally, JDM never lost his love for the work. When he was in his sixties he cited it as one of his "desert island books." It's a difficult novel but I consider UNDER THE VOLCANO one of my "desert island books" also. I've since seen the movie directed by John Huston, and read everything I could about Malcolm Lowry including his letters and biography. Strangely enough, none of his other fiction ever impressed me at all. Unlike JDM, Lowry was a one book author but what a book!